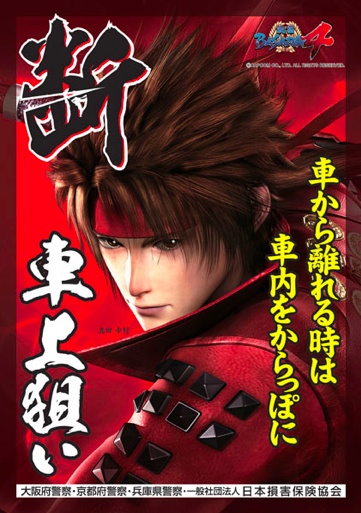 This week's edition of Weekly Famitsu didn't have any substantial Sengoku Basara coverage even though series producer Kobayashi 'KobaP' Hiroyuki participated in a joint interview with Tales producer Baba Hideo. 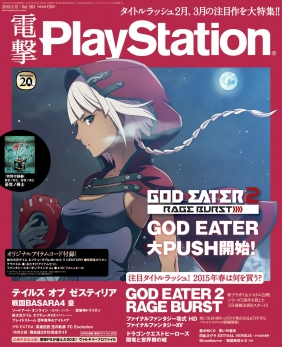 Instead, it was Dengeki PlayStation's turn for a little exclusive content. The 12th February 2015 edition (released on 29th January 2015) had a full-colour eight-page feature devoted to previewing the new game. 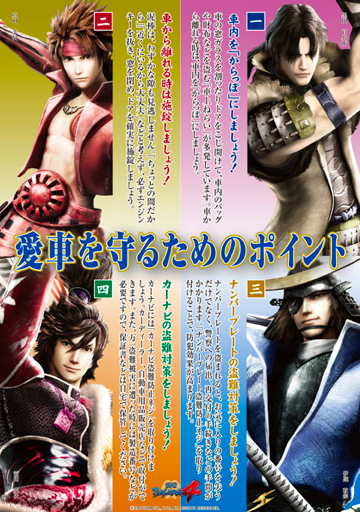 Most of its article recapped the information from the previous Weekly Famitsu to bring readers up to date with the Sengoku Basara 4 Sumeragi announcement. However, there also seemed to be a few new screenshots I wasn't sure that I had seen before (even though the official website updated today with another batch) and a short interview with KobaP and director Yamamoto Makoto. I think it's worth a summary. Firstly, information from the character profiles. Ashikaga Yoshiteru's roulette technique will make him glow like it does in Sengoku Basara 4. A red glow means a speed increase, black boosts his attack power and gold - which is said to be rare - stops time around him. There's a small picture of Yoshiteru standing in front of Takeda Shingen and Uesugi Kenshin right below the previously-published screenshot of him in front of the four main characters. Shingen seems to be down on one knee with his weapon in one hand - I can't tell what Kenshin is doing from the angle but the two of them look reasonably relaxed. A new picture of Maria shows that the red curtain in the background of one of her early screenshots is related to the Xavist show, as several people suspected. A group of excited Xavist soldiers can be seen in the audience. Another new picture shows Naotora carrying Maria like a princess. Naotora looks a little bothered by the situation, even though Maria is clearly enjoying herself. There's a new screenshot of Sabisuke (Sen No Rikyuu's 'wilder' personality) sitting on the battlefield with Matsunaga Hisahide standing right in front of him. Next, summarised information from the interview with KobaP and YamamotoD. When asked why they opted to make the new game Sengoku Basara 4 Sumeragi rather than Sengoku Basara 5, KobaP explained that they've had the series' tenth anniversary in July 2015 in mind for a while. However the real reason is that there was still more they wanted to do with the Sengoku Basara 4 setting, so that's why this game is an expansion instead of the next title in the series. Since it's coming out during the tenth anniversary they want to pack it full of content. YamamotoD added that this will actually be the eleventh game in the series, so they've effectively released more than one game per year! They're aiming for the game to have a lively, fun atmosphere. Sengoku Basara 4 was about creating the Sengoku era, while this time around the theme is 'seeing how much you can play in this Sengoku era'. It's being made with a 'party game feel' in mind. It's the definitive version of Sengoku Basara 4 which surpasses the original (note: the way he said it didn't specifically suggest that this would include any of the story content from Sengoku Basara 4 - it was a lighthearted remark and probably means it will have more replay value than the original). Yoshiteru, Maria and Rikyuu are the three main characters this time. Yoshiteru is powerful right from the beginning. KobaP thinks that action game fans will really enjoy using him. Yoshiteru's new 'quake' element means he's capable of effects like being able to split the earth for short-range attacks, and causing the ground to shake in order to affect a wide area. YamamotoD said that Rikyuu's 'macho' build was unexpected when the interviewer remarked that he was surprisingly muscular for a tea master. His clothing was influenced by the idea of making tea with a chasen (tea whisk) and making it suitable for his two personalities. His hairstyle looks as though it's from the Joumon period, and it's supposed to give the impression of austerity. Maria moves as though she's playing around rather than fighting, treating the enemy soldiers like animals. KobaP told the readers that they have to wait a little longer to find out who the other playable characters are going to be. They have made quite a few story encounters. There's a strong sense of variety in the stories this time around; they've tried to show different sides to the characters and there will be both serious and comical content. The battle roulette system will make the Sengoku Basara 4 stages feel different and change the difficulty. There will be medal rewards of skill upgrades and costumes for all forty playable characters. You can choose to play the stages without battle roulette in Free Battle mode if you prefer. Aside from the roulette system, they are continually trying to improve the characters' moves; for example, making HELL DRAGON usable in midair. The anime screenshots that have been shown so far are from the game's animated opening movie. While not every character will get them, the game's story modes will also include 'more anime scenes than there were in Sengoku Basara 4'. KobaP still can't confirm whether 'that person' (obviously T.M.Revolution) will be performing the game's theme song. However, he said there would be an announcement about it very soon. Sengoku Basara 4 was the first time they tried adding downloadable content to the games. They'll be incorporating DLC again this time. It was implied that all five of the next collaborations they have planned (following on from the Tales Of Zestiria outfits) will be DLC too. The magazine doesn't mention the number of players anywhere (not even with an 'unconfirmed' label like in Weekly Famitsu). This might mean that the information was something Famitsu added on its own rather than a hint. Here's a nice observation about Sen No Rikyuu's flowers from fan Error256. I hadn't made the connection but you can read about the original story here. Several Japanese fans have spotted early preorder listings for the PS3 and PS4 editions of the game at Animate. Perhaps it won't be too long until the game is formally solicited for preorder. It's just a couple of days now until Basara Matsuri! I'm convinced that they'll be showing some video footage at the event, so it will probably appear online on Sunday night or Monday morning based on the last two live shows. There's a big 'coming soon' in the video section on the official website which needs to disappear, right? That's all the magazine coverage for this week, but there are a few other news stories to mention as well. Yukimura, Kanbee and Keiji will be expanding their previous campaign to prevent vehicle crime across Osaka, Kyoto and Hyogo again this year; a collaboration so significant that it received another English-translated news bulletin on Capcom's investor relations website. A ceremony will be held in front of the Shirayukihime clock at Osaka's Tennouji Zoo on 31st January 2015 to mark the commencement of the campaign. The mascot character 'Yuru-Tenha Zessou Yukimura-kun' is scheduled to attend - his name seems to have been upgraded since the last time he made an appearance! Just like last year, there's going to be a Capcom presence in the Marui Annexe building in Shinjuku, Tokyo as part of the 'Shinjuku Marui Annexe Characters Fair ~Gyakuten Saiban, Monster Hunter, Sengoku Basara~'. Visitors will be able to purchase goods relating to Sengoku Basara, Monster Hunter and Gyakuten Saiban (Ace Attorney) between 13th February and 15th March 2015. There will also be prize draws where fans can win special merchandise. Looking for Sengoku Basara 4 dialogue translations? Moemine's Sengoku Basara 4 translation page on Tumblr has had a big upgrade recently and it's easier than ever to find translated dialogue for your favourite character. Moemine deserves a lot of respect for all of the fantastic translation work; I though it was worth mentioning again since not everyone checks Tumblr regularly. There's even more new content! Also, Quake seems to be the Earth type then? Like, there's emphasis on it NOT being quake as in earthquake but the emphasis on earth-shattering moves makes me suspect it has to be. I wonder if we'll get any element changes. If so, Hideyoshi could certainly be a Quake type, as could Kanbei. The element that Rikyuu has, just by its name, could also fit the likes of Sorin, Tenkai or Kasuga too. However, if the two simply have unique elements, that's fine. The fact they mention "story modes" makes me hopeful the other "new" characters, whoever they may be, will also get stories. If it's who we suspect, hey, maybe Tenkai will get a Mitsuhide story too, haha. And the fact that all playable characters are gonna get at least one alt (probably more as the unlocks seem to be in addition to the other alts) makes me feel a sense of relief. That's a good point about the other characters; I think they're keeping the element unique for Yoshiteru at the moment but it would certainly fit a couple of the others (they probably want to keep Hideyoshi as light opposite Hanbee's dark, though).